Are you seeking professional door installation for your new wooden door? Southern Front Doors is the epitome of door professionals in the Greater Houston area. We can install any door for you in a professional manner that ensures it is totally foolproof. Don’t try to do it yourself, or let a friend do it. Improper door installation can allow water or insects to allow themselves into your home. No one wants tiny foreign invaders crawling their home. Because of this, you want to make sure your door is installed properly. You might be asking, why does it matter who installs your door? As long as you can open it, right? Actually, improper door installation can lead to all sorts of issues. Water leaking in, insects finding passage inside, and the general weakness of your door can occur. If someone tries to break into your home, you don’t want them to take advantage of poor, unprofessional door installation. It may be easy for them to get past a door that wasn’t installed by Southern Front Doors. We can install wood doors, but we can also do steel, fiberglass, or iron doors. If you order from our online inventory, we can come by your house and install your new door for you. We can also do it if you haven’t ordered from us! Southern Front Doors also creates beautiful custom doors. If you follow this link, you will be taken to our online inventory. Here you can view our extensive options of material, size, shape, and style. You can purchase doors from this website and have them shipped straight to your home! You have nearly limitless options that can make your new doors as unique as possible. 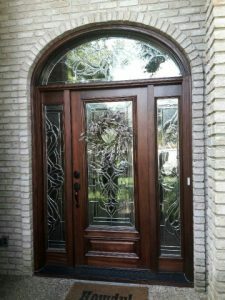 We also specialize in beautiful custom doors that can have beautiful glass and ironwork on them. You could have the most beautiful door in your neighborhood! We offer the best-of-the-best wooden doors. This is why we only stock the highest grade wooden material – Mahogany, Knotty Alder, and Andean Walnut. These door materials are known for their beauty, sturdiness, and resilience. These are the doors that will withstand the test of time on your family home. If you are building or renovating a home you would like to keep in your family, wooden doors will withstand the test of time and change of seasons. Wood will never go out of style, nor will it fail you. We know that you want the best. That’s why we provide the best. We perform professional door installation for all doors, regardless of whether you ordered it from us or elsewhere. To contact us, fill out our contact form here or call us at (281) 890-5860. We are fully prepared to fulfill all of your door installation and purchasing needs. You will find no one better in Texas to provide this service to you! Contact us today.